La Gloria — Colombian bullfighter Rocio Morelli, 23, made her United States debut Sunday at the only American venue solely dedicated to the sport. Santa Maria Bullring has hosted bloodless bullfights since opening in 2000. As Morelli, and the other bullfighters prepared to enter the ring, spectators settled in getting last-minute beers or tacos before the show. “They’ve been coming here for years,” said owner Fred Renk, 82, of the crowd. He said the atmosphere draws visitors. Frederick Martin of McAllen was in attendance with his family. “I think it’s really neat that they still have this and any year could be the last year because Fred is getting old,” he said. After the fight, the Martin’s were among the throngs surrounding the matadors for photos. His daughter got an autograph from Morelli on her event poster. “My daughter sees her and realizes that girls can do anything,” Martin said. Ring announcer David Cazares said matadors conquering bulls during bloodless bullfighting could be a more impressive feat than international events where bulls are killed. 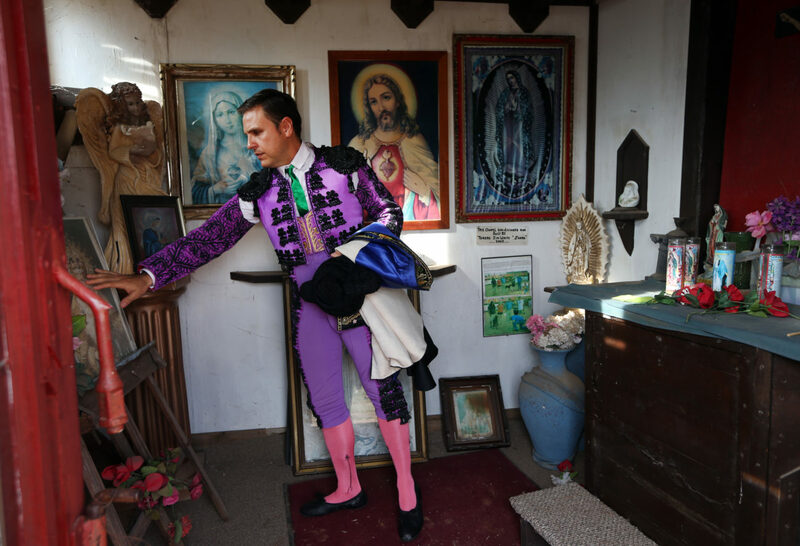 “It takes a special kind of bullfighter to even attempt bloodless bullfighting because the bull isn’t dying,” he said, adding that they lose energy during that fatal battle. Cazares said they were lucky to have her in the Rio Grande Valley and country. Framed posters and articles hung make the venue part museum. There’s a map with pushpins marking the visitors from around the country. Renk said the bullring is a celebration of his son David Renk “El Texano,” the youngest North American to earn the title of matador receiving his doctorate in 1981. His son died last September. During the intermission, Renk hopped on a tracker to smooth the ground in the ring. The ring is also a shrine to the art, and something Renk wants locals to experience.